The brothers of the Justice League share it all at SDCC 2018 – AiPT! Scott Snyder, James Tynion IV, Joshua Williamson, Adam Glass and Bernard Chang talk what’s next for the Justice League. DC brought together the talented “brothers” behind DC’s “New Justice” movement to share their inspirations behind some of your favorite DC superheroes and to discuss/spill what’s in store for the Justice League. 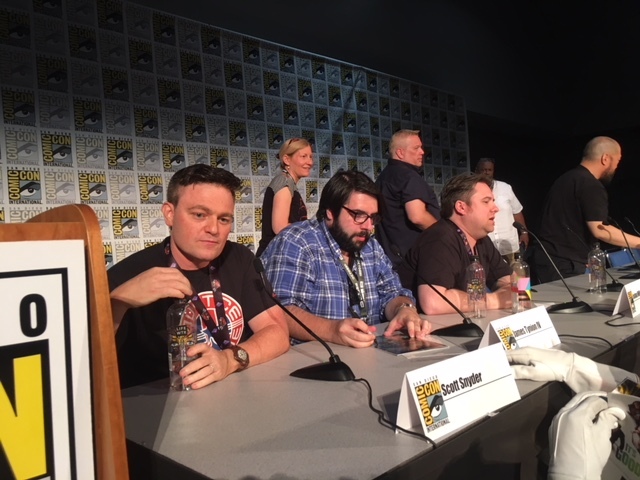 On tap were Justice League writers Scott Snyder (Justice League), James Tynion IV (Justice League Dark), Joshua Williamson (Justice League Odyssey), Adam Glass (Teen Titans) and Teen Titans artist Bernard Chang. When the art came on the screen there was no stopping Snyder. “Justice League is the book I dreamed of writing since I was a kid.” Here’s a synopsis of what he shared. Every 4-5 issues are going to show the viewpoint of Doom. Issue 6 SPOILER is all about Joker! Batman will be written as a comic relief. Snyder will work in pairs: Hawk Girl & Martian Manhunter, Superman & Batman, Aquaman & Wonder Woman. Issue 10 “Drowned Earth” Aquaman story (coming in October) divinity and magic unlocks ancient sea gods that ask, why do you think there is no sea life anywhere except Earth? You can expect to see Batman’s worst nightmare, the Batman Who Laughs’ henchman; a Punisher-like Batman. Magic is backfiring around the world and something is coming from the other side of the darkness. The source wall is open and the original owners of magic are coming back and do not care what stands in the way. Wonder Woman, Zatanna, Detective Chimp, Swamp Thing and Man-bat will team up to fight this evil. Issue 5 & 6 will be big Detective Chimp stories. Blue Devil will make an appearance later this year in Justice League Dark as well. If you like Wonder Woman you will like the role Dianna plays in the universe.